THE STORY - Set in 2045, with the world on the brink of chaos and collapse, people have found salvation in the OASIS, an expansive virtual reality universe created by the brilliant and eccentric James Halliday (Mark Rylance). When Halliday dies, he leaves his immense fortune to the first person to find a digital Easter egg he has hidden somewhere in the OASIS, sparking a contest that grips the entire world. When an unlikely young hero named Wade Watts (Tye Sheridan) decides to join the contest, he is hurled into a breakneck, reality-bending treasure hunt through a fantastical universe of mystery, discovery and danger. THE GOOD - Jaw dropping visuals and incredibly well staged and exciting action set pieces with fun references throughout. THE BAD - Spielberg presents his message of nostalgia and escapism with nothing new to say. No one has a character arc. Hammy dialogue. The treatment of Olivia Cooke. ​​​​I almost cannot believe I am saying this but along with his questionable viewpoints on Netflix in recent weeks and now the release of his latest film “Ready Player One,” I think it’s time to finally declare that Steven Spielberg is not the genius or forward thinking individual within our culture as we once thought. At 71 years of age, perhaps he should stick to making historical dramas and times of old because his commentary on the youth of today and their need for escapism is a shallow former shell of itself. And this is coming from the man who helped build much of the fanboy/geek culture of today through films he either directed or produced. It baffles me that I could sit through a 140 minute film about people living inside of a virtual reality world, made by a two-time Academy Award-winning director who has given us some of the greatest popcorn entertainment films of all time and be left without a single piece of social commentary or important message that wishes to say anything new or meaningful. Perhaps he was hurt by the source material (Which I have not read but have been told has its fair share of problems). Or perhaps, this is what Spielberg intended: A mindless, fan serviced romp through a video game-like world filled with so much nostalgia and references that we would be in such awe and glee that we would overlook the film’s flaws. Well, if that’s the case, I’m not playing. Set in Columbus Ohio in the year 2045, “Ready Player One” follows Wade Watts (Tye Sheridan), an orphan living with his aunt who escapes from reality along with the rest of humanity in a virtual simulator known as the OASIS. In the OASIS, you can be whoever you want to be and do anything you want as well. It’s essentially the largest video game ever created, filled with unlimited amounts of weapons, power-ups, and worlds to explore. The OASIS was created by the brilliant social outcast James Halliday (Mark Rylance), who after he dies, leaves an easter egg hidden within the OASIS which will grant the person who finds it, complete control over the OASIS. To do this, the person must find three keys within the OASIS which were left behind with clues from Halliday. Taking on the avatar name Parzival, Wade sets off on this quest (Commonly known as a Gunter - or egg hunter) aided by his best friend Aech (Lena Waithe) and meets a fellow gunter along the way named Samantha/Artemis (Olivia Cooke) who wants to find the keys before IOI (Innovation Online Industries) and its ambitious and greedy leader Nolan Sorrento (Ben Mendelsohn) do so. Now before everyone gets their pitchforks ready, I’ll be first to say that I definitely enjoy a good ol’ popcorn flick. If done well, there’s nothing wrong with shutting your brain off, laughing and having a good time at the cinema. “Die Hard,” the first “Pirates Of The Caribbean” or even the first “Transformers” film comes immediately to mind as a few movies that delivered in terms of spectacle and presented very clear storytelling. While they were hindered by a few problems here and there, those issues were ultimately forgivable due to those film’s desire to not be taken too seriously. The problem with “Ready Player One” is that it definitely has a message. And Spielberg has set the bar so high for himself that we should be expecting more of him. I was ready to forgive this oversight as one of the problems of the film and move on should the film deliver in other areas, which it most certainly does. It has some breathtaking visuals that show us how we have come since the early days of visual effects performance capture in “Avatar” or even Steven Spielberg’s own “The Adventures Of Tintin.” The world building through the production and costume design are elaborate and filled with easter eggs that will inspire many to pause their BluRay players and search for the little goodies for many years to come. And the action set pieces are certainly well staged and sound absolutely incredible. However, a complete movie will always come back to story and character. 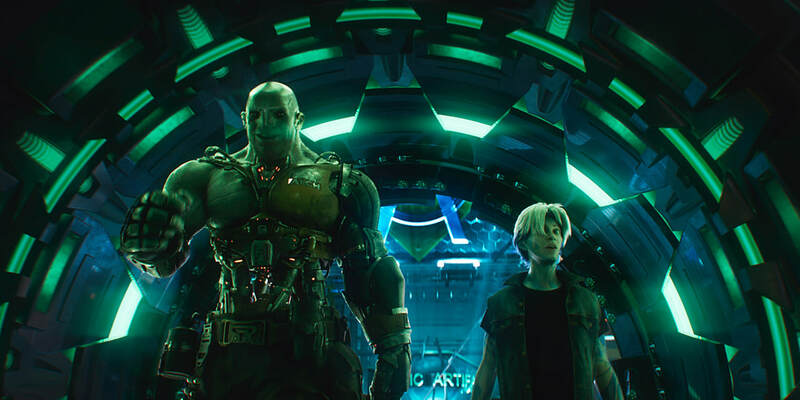 “Ready Player One” has assembled a diverse and talented group of actors but outside of Ben Mendelsohn, none are given enough in the script to either give us a fully realized performance or an interesting character arc. They are exactly like their avatars: completely artificial and without a care in the world because, at the end of the day, they’re starring in a Steven Spielberg film. And don’t get me started on this film’s sexual politics in how it handles Olivia Cooke’s character. As seen through the eyes of the film’s straight, white male protagonist, Spielberg fan services the hell out of a nonexistent love story and shockingly objectifies Olivia Cooke on screen to the satisfaction of lonely nerds everywhere hoping that they too can meet their twitch crush and win her over. Don't believe me? Look to the first time Wade lays his eyes on Samantha and is immediately awestruck by her beauty while she's dressed in a one sleeve with tight jean shorts. And if that were not enough, one has to wonder (Considering we never see the physical actor on screen) why T.J. Miller's character was not completely re-dubbed considering the actor's recent allegations of sexual assault? It only adds to my belief that Spielberg is slowly falling out of touch with what this generation wants and expects of him considering his iconic status within the film industry. “Ready Player One” wants us to be mindful of the world we have created for ourselves online and urges us to appreciate the world outside of it. It presents this idea but it does not explore it fully enough. Unexplored ideas, nonexistent character arcs and a third act so washed up in bad dialogue and sentimentality, not even all of the cool action sequences, visually dazzling effects or cheap 80’s musical hits could get me to overcome this film’s issues. Of course, many will see past these issues and have a great time regardless and that’s totally fine. It sure is pretty to look at and has a number of awesome references and set pieces throughout (The sequence entirely dedicated to Stanley Kubrick's "The Shining" is particularly good) but for this Spielberg fan who holds the man in such high esteem, this is simply not enough. It's game over for me, for now, until I am ready to play Steven Spielberg's next game again. Only next time, let's not make it a cheap fan service video game out of touch with what is truly going on in our world today.